Around 600 Australian children are diagnosed with cancer each year. While we celebrate the medical advances that have led to increased survival rates (now around 80% across all childhood cancers), we understand that more needs to be done for each family that traverses this difficult path. 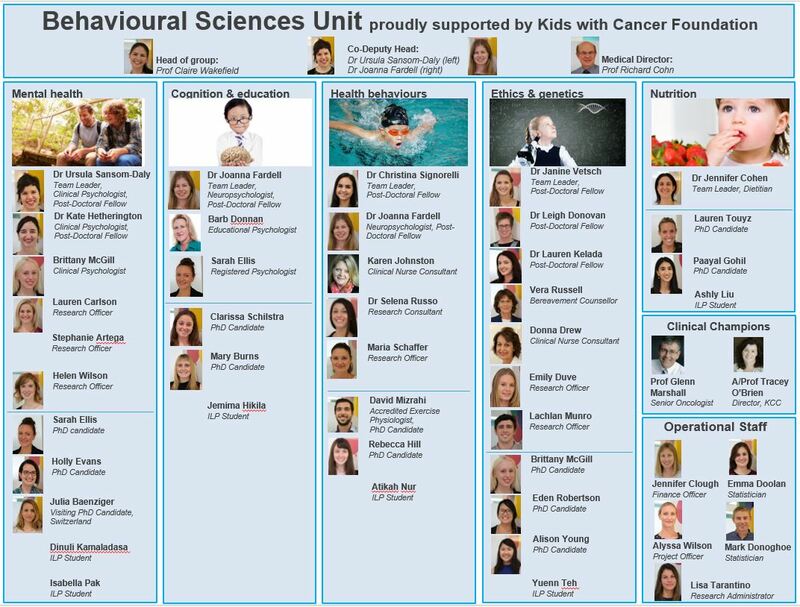 The Behavioural Sciences Unit, proudly supported by the Kids with Cancer Foundation. The BSU is a part of the Kids Cancer Centre at Sydney Children's Hospital, Australia and is proudly supported by the Kids with Cancer Foundation Australia. Our Unit undertakes psychosocial and nutritional research as related to paediatric oncology. Simply put, we evaluate many of the challenges families face from the time their child is diagnosed through to survivorship or bereavement. Membership of the BSU is multidisciplinary, with representation from psychology, dietetics, paediatric oncology/haematology, social work, nursing, bereavement counselling, behavioural sciences, and exercise physiology. We also include consumer representatives for all projects. As well as conducting rigorous scientific research here in Australia, we also maintain close ties with international experts from the USA, UK, the Netherlands, and Canada. Our work is presented at several international conferences each year. The quality of BSU research has been recognised through the receipt of numerous academic awards, government grants and international peer-reviewed publications and we strive to support our families through the continuation of such gold standard research. Conduct translational research The primary aim of the BSU is to conduct world-class research that can be translated into practice, quickly and effectively, so that each new generation of families has a better experience than the last. Maintain a strong track record The BSU also aims to maintain a strong track record of publication and conference presentation, as well as a strong financial record of grant funding. The BSU expects to produce a minimum of 10 publications annually, published in top-tier international journals; a minimum of 10 abstracts accepted by national and international conferences; and sufficient funding to support the group’s research activities. Provide research support to the Kids Cancer Centre Research support is provided to both students and clinical colleagues of the Kids Cancer Centre. Specifically, the BSU will provide support to students in the form of supervision and clinician consultation. The BSU also conducts a program of tailored workshops on common research topics, such as literature reviews, qualitative and quantitative data analysis, ethics applications and questionnaire design available to Kids Cancer Centre members. "The unique position of the BSU makes possible the collaboration of researchers, clinicians, health care professionals and consumers for the advancement of cancer care." Our mental health team focuses on research to prevent and/or better manage negative psychological outcomes in families affected by paediatric cancer using evidence-based psychological interventions and state of the art technology. We particularly focus on those most at risk and underserviced. Currently recruiting studies include Recapture Life, Cascade and Difficult Discussions. Our health behaviours team focuses on researching ways to minimise the ongoing burden of treatment for childhood cancer through health and lifestyle interventions, and the development and evaluation of models of care which address the barriers to receiving optimal cancer-related follow up care. Currently recruiting studies include the LTFU study, GP study, and Re-engage. Our cognition and education team is committed to improving outcomes related to the social and cognitive development of childhood cancer survivors. Research areas of interest: school re-entry, scholastic outcomes, friends and relationships, life milestone achievements (e.g. completing education / training, living independently, career promotions, getting married). Currently recruiting studies include EduSwell, Ready, Steady, School, and Reconnect. Our nutrition team focuses on researching strategies to optimise the nutritional intake of childhood cancer patients throughout the cancer journey from diagnosis to survival. Research areas of interest include: diet intake, diet quality, blood and marrow transplant, enteral feeding and diet interventions. Currently recruiting studies include ReBoot Kids and ReBoot Adolescents. The ethics and genetics team is investigating the psychological impact of genetic testing in childhood and working towards the ethical implementation of new technologies and experimental therapies into the cancer clinic. Currently recruiting studies include Delta, Compass and PRISM. Visit "Our Team" page for contact details, or our Psychologist, Research Officer, Student, International Visitors and Volunteer pages to learn more about the BSU team.